Dagoth Girer is an Ash Ghoul in the service of the Sixth House. He can be found at Kogoruhn, in the Dome of Pollock's Eve. Dagoth Girer is one of several Ash Ghouls who is capable of speech, provided you can sneak up on him or cast Calm to stop him from attacking. Oddly enough, he is also a merchant, though he has nothing much to sell and no gold with which to buy things. He does, however, provide repair services at base-cost, which you can take advantage of. 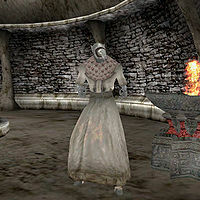 Dagoth Girer's dialogue is identical to the other Ash Ghoul Dagoths at Kogoruhn. Greeting 1 — What? What use is speech? If you will not submit, you must be destroyed. Greeting 2 — For our fallen brother, we claim our revenge. Topic: "will not submit" — You have chosen war with Dagoth Ur. We grieve for your loss, but we will not spare you. You refused the sweetness of Lord Dagoth's friendship. Now know the bitterness of his fury. Topic: "fallen brother" — The soul of Dagoth Gares is among us. You have broken his body, but his spirit is with us in our waking dreams. Topic: "Dagoth Ur" — He will not come to you, Lord Nerevar. It is you who must beg forgiveness. Go to him, beneath Red Mountain, kneel before him, and he will show you mercy. This page was last modified on 26 August 2016, at 00:56.